Today in forex trading the GBP/CAD had a buy signal on The Forex Heatmap®. The CAD (Canadian Dollar) weakness was consistent on all pairs. This pair is starting a new trend on the D1 time frame, so it has good pip potential upside going forward for several days. The longer time frames are mixed on this pair. We will continue to plan additional buys on this pair in the upcoming trading plans, and we will treat this as a swing trade on the D1 time frame. The heatmap can be used to enter short term or long term trades based on the existing trends of the market. 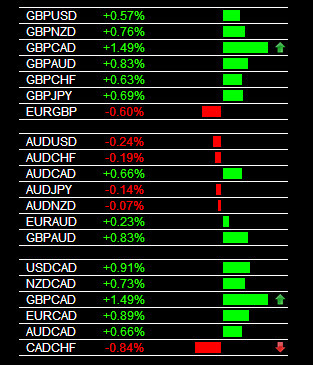 Today in currency trading the CAD (Canadian Dollar) weakness was visible on all pairs. There was also some British Pound (GBP) strength in the market today. This drove the GBP/CAD strong to the upside. The movement was very good, but we would consider this a short term trade because it is inside of resistance layers on the higher time frames. So we would close out some lots or exit the trade completely. The trading signals for the CAD you see below are from The Forex Heatmap®, which provides live buy and sell signals for 28 currency pairs. Today in currency trading the NZD/CAD had a buy signal on The Forex Heatmap®. The Canadian Dollar (CAD) was weak on all pairs and this caused price movement on various CAD pairs. The EUR/CAD also moved up fairly strong, and this pair should continue higher to the next resistance area at 1.4450. The NZD/CAD moved up and this pair is at one resistance area so we would be scaling out lots and taking some profit at the current price levels. The trading signals you see below are from The Forex Heatmap®, which provides live buy and sell signals for 8 currency groups and 28 pairs. The heatmap is based on currency strength and parallel and inverse analysis. 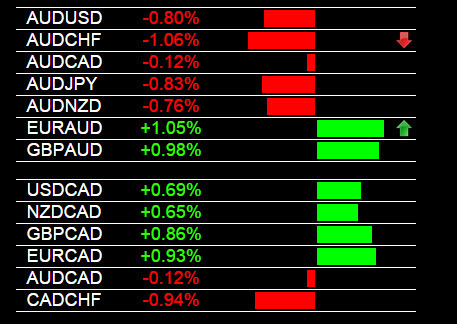 Today in currency trading the CAD (Canadian Dollar) was weak on pairs, driving strong price movement on several pairs. The AUD (Australian Dollar) was also weak today. The AUD/CHF dropped, but this pair is at one support level and we would be scaling out lots on this pair and taking some profit at these price levels. The EUR/CAD moved up strong and should trend up and continue higher to the next resistance level at around 1.4325. Today in forex trading The Forex Heatmap® signaled a sell on the CAD/CHF. The Canadian Dollar (CAD) was weak on all pairs. There was also some Euro (EUR) strength and Swiss Franc (CHF) strength in the market. This caused the EUR/CAD to move higher and the CAD/CHF to drop. We would scale out lots on both trades, as these movements were against the larger trends on the higher time frames. The trade signals you see below are from The Forex Heatmap®, which provides live trade signals for 8 different currency groups and 28 pairs. Today after the Canadian employment news report, the CAD (Canadian Dollar) was weak on all pairs. Employment Change statistics came in at -9,400, and the unemployment rate edged up to 7.1% in June from 7.0% the prior month. For traders, movement cycles on the CAD pairs were very good. Most of these pairs are not trending, but trading inside of ranges, so we consider these to be short term moves. The GBP/CAD did break out of one resistance level and it could continue higher to the next resistance area at 1.8450. The live currency strength indicator you see below is The Forex Heatmap®, which provides live buy and sell signals for 28 pairs. It works in most market conditions like after forex news drivers. Today after the Non Farm Payrolls news, the Canadian Dollar (CAD) was weak on all pairs. The Canadian news drivers like Unemployment Rate and Labor Productivity were reported at the same time as the US Dollar Non Farm Payrolls news. Pairs like the USD/CAD and EUR/CAD moved up quickly after the news and new buy entries were more than likely not possible due to the somewhat immediate price spikes. The EUR/CAD is trending higher and is nearing a resistance breakout point. We will look to set a new trading plan for a buy on this pair Sunday night of Monday of next week. The live trading signals you see above are from The Forex Heatmap®, which provides live trading signals on 28 pairs. It works after non farm payrolls for assisting with trade entries, it also works after any scheduled or unscheduled forex market news. Traders can also review our complete written guide to trading non farm payrolls. Today in forex trading the market signaled consistent CAD weakness on all pairs. This drove strong and consistent price movement on these pairs. All of the Canadian Dollar (CAD) pairs could be traded today on this basis since most of the cross currencies were neutral. We would scale out lots on any trades as most of these pairs are inside of resistance or support ranges on the H4 time frames. You can check our trend indicators. The forex signal system you see is the The Forex Heatmap®, a real time signaling system for 28 pairs. Today in forex trading the GBP/CAD pair had a clear buy signal. This pair moved up substantially during the main forex trading session. It is approaching the next resistance area at the 1.8400 area. Since it is approaching resistance we would scale out lots and manage trading profits. We will check the other GBP and CAD pairs later today and see if we can issue a buy plan for a breakaout of the resistance. The live trade signals you see below are from The Forex Heatmap, our real time trade entry management system.